MedMen recently broke ground on a high-tech cannabis factory in Desert Hot Springs, California, the company’s second, large-scale marijuana cultivation and manufacturing facility. 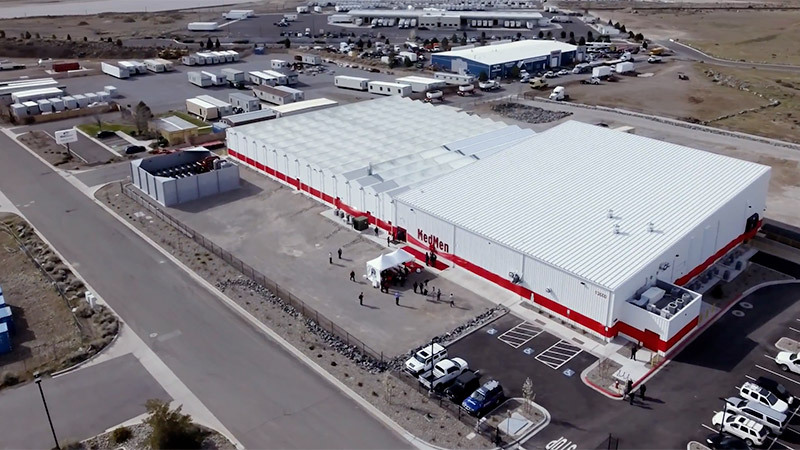 In April, the company inaugurated this new class of factories in Mustang, Nevada, with the largest, most high-tech facility of its kind in the state. Watch the Mustang Grand Opening video. The two facilities have the same foot-print and design; a 26,000-square-foot Dutch-style state-of-the-art greenhouse with 100 percent controlled environment and a 19,000-square-foot manufacturing wing with two extraction rooms, two industrial kitchens, high-tech analytics lab and a tissue culture lab to ensure healthy plants and high yields. Each factory is capable of producing 10,000 pounds of high-quality cannabis annually. The Desert Hot Springs facility is scheduled to open in early 2019 and service California’s fast-growing adult-use marijuana market, estimated to be worth $7.7 billion in annual sales by 2021. The company also owns and operates an indoor grow, research and development facility in Los Angeles. The same factory design also will be used for MedMen’s factory in Utica, New York, with construction expected to begin sometime this year. At full capacity, the factories are expected to employ about 100 workers each, from plant trimmers to lab technicians.